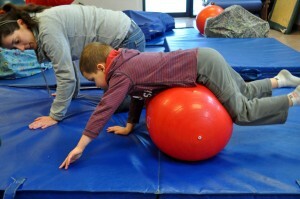 Core/postural strength is necessary to complete almost any activity. With a strong base of support in the trunk, the arms and legs are free to move with control. Without this strength a child may not be able to sit up or may fatigue quickly. This can impact their ability to write, pay attention and play sports. The flexor muscles allow for flexion of the stomach and shoulders in toward the body and the extensors allow for straighter posture with the head held up, shoulders back and trunk straight. There must be a good balance between theses muscles to provide trunk stability. The extensor muscles tend to be much weaker, preventing the child from adequately sitting well and for any length of time. To improve trunk stability it is necessary to improve the extensor tone in the trunk and develop good stability between the flexors and extensors. Sitting criss-cross, pass a weighted ball to the person on one side and receive it from the other side, then reverse rotation. When sitting at a desk or table use a wiggle seat (air filled cushion) which allows for movement while sitting. 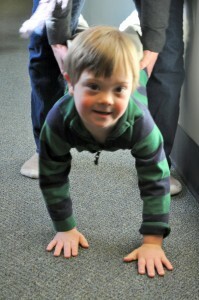 Wheelbarrow walking with an adult holding onto the child’s hips, knees or ankles (depending on the amount of support needed) so that the child’s body is horizontal and they are supporting themselves with their arms out straight to walk. Pretending to be a superhero or airplane while lying on their stomach trying to hold their head, arms and legs off the ground.